Found in Cala d’en Bosch, a few km from Ciutadella de Menorca, the Apartamentos Roc Lago Park are traditionally Mediterranean-style apartments designed for families and couples, just 400m from the beach. Surrounded by gardens, the apartments offer an entertainment programme, including games and sports, and the complex has outdoor pools, a snack bar and a buffet restaurant. Furnished in a modern style, each apartment has a lounge, kitchen, flat-screen TV, bathroom and a terrace or balcony.Please note that Sustainable Tourism Tax is not included in the rate and needs to be paid directly at the hotel. Its value varies from 0.28-2.20€/person/night depending on the category of the hotel. Children under age of 16 are exempt from the tax, longterm holiday makers will have a 50% discount on the tax from the ninth day of their stay. These adults-only apartments are situated on the ground floor of a residential area, surrounded by relaxing gardens. There are a swimming pool, a snack bar and a terrace. The apartments feature 1 twin bedroom, a lounge with a sofa bed and a private bathroom with a shower and hair dryer. There is also a furnished terrace and a kitchenette with microwave, electric hob and fridge. A safe is available for hire. Bed linen, towels and kitchenware are included. There is free WiFi. From the property, you can go on excursions by bike around the beautiful spots of the island, including the Faro de Artrutx and Cala'n Bosch beach. This property is also rated for the best value in Cala'n Bosch! Guests are getting more for their money when compared to other properties in this city. At Lago Resort Menorca Spa & beach club - Adults Only, enjoy a satisfying meal at the restaurant. Wrap up your day with a drink at the poolside bar. A complimentary breakfast is included. At Grupotel Macarella Suites, enjoy a satisfying meal at the restaurant. Buffet breakfasts are available daily from 8 AM to 10:30 AM for a fee. At this aparthotel, enjoy a satisfying meal at the restaurant. Unwind at the end of the day with a drink at the bar/lounge or the poolside bar. 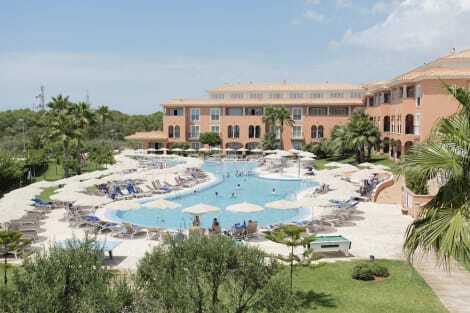 The modern 4-star Sol Falco is a resort just a few minutes from the beach and 11 km from Menorca Cathedral. Its facilities include 7 outdoor swimming pools, a children's pool, a beach volley court a gym, Sol Falcó Restaurant, the Lounge Bar and Cafeteria, and Tex Mex Snack Bar. The smartly decorated, modern rooms feature flat-screen TVs, mini-bars, mini-fridges, and bathrooms with modern shower units and rain-effect showerheads. Completely refurbished in 2018, the 4-star Carema Beach Menorca offers direct access to the white sands of Cala’n Bosch. You can take in sea views from the hotel’s open air pool and its buffet restaurant, which specialises in Mediterranean cuisine, while the hotel’s front desk staff are there to assist you at any time. The hotel’s rooms and apartment-based accommodations offer air conditioning, private bathrooms, TVs and free wi-fi access. Zafiro Menorca is a modern 4-star aparthotel, just a 15-minute stroll from Cala ‘n Bosch beach. Ideal for families, the hotel has 3 pools and a selection of sports activities, and you can enjoy themed buffets at the Caprice Restaurant and treat yourself at the Babalu café bar and La Palapa pool bar. Zafiro Menorca’s apartments all offer kitchen facilities, air conditioning, TVs, private bathrooms and free wi-fi. lastminute.com has a fantastic range of hotels in Cala N Bosch, with everything from cheap hotels to luxurious five star accommodation available. We like to live up to our last minute name so remember you can book any one of our excellent Cala N Bosch hotels up until midnight and stay the same night.